In the culinary world, there is no love more pure than the love for bread. That heart warming smell of bread baking in a wood fired oven inspires passion and love in all of us. 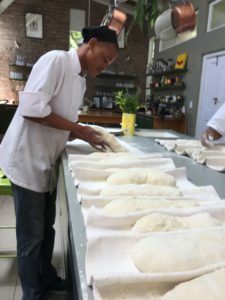 Understanding fresh ingredients, good flour and wild yeast will open your eyes to this true art form a lot of people have dedicated their lives to mastering and sharing with those around them. It all begins with a proper sourdough starter, or preferment. To grow a sourdough starter is very rewarding. The moment you grasp the concept of activating wild yeast, nurturing your sourdough and keeping it alive and well fed, the possibilities are endless. Your sourdough starter can be kept alive for years, even decades if you take care of it. 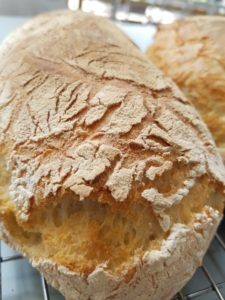 For me, there is nothing better than the classic Ciabatta. All it takes is a good preferment, time and patience. 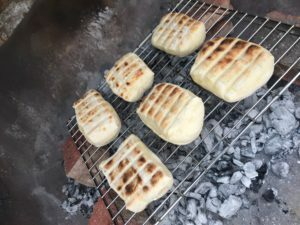 There are no shortcuts to a proper bread and if you have a wood fired oven, make sure to build your fire some time in advance because you need a good, consistent heat to bake the perfect bread. Conventional oven setting should be 180 degrees Celsius. Start your preferment or sourdough starter at least two days in advance for best results and it can be used in conjunction with dried instant yeast for best results. Continue feeding your sourdough and keep in the fridge for future bread baking. As simple as that. Use an airtight container like an old ice cream container and mix the flour and water and sugar together until a smooth paste. Put the lid on and store in a space where it is warm and cozy. Any temperature between 20 degrees and 30 degrees Celsius will do. You need a warm temperature to activate the wild yeast in the flour and the sugar feeds the yeast. Allow to stand for at least 12 hours until bubbly. Feed the starter with 1/3 cup of flour and 1/3 cup water and allow to stand for another 24 hours. It will be ready for use after two days of fermenting and feeding. Your starter can be kept in the fridge and can be taken out 30 minutes prior to use. 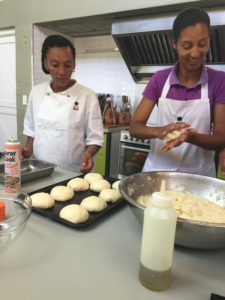 In a big bucket with a tight fitting lid, start by mixing all ingredients until the dough is a smooth and wet consistency. It must look like a runny batter almost. Adjust the amount of water you use to get to the right consistency. Put the lid on and allow to stand for 30 minutes. Flour your work surface well and turn the dough out of the bucket onto your work surface. 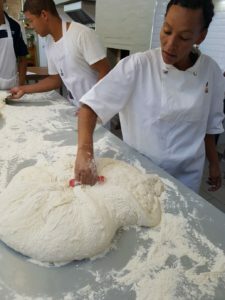 Using a dough scraper, fold the dough from the sides to the middle cutting the dry flour into the dough until well mixed. Return the dough to the bucket, rest for another 30 minutes and repeat folding procedure. 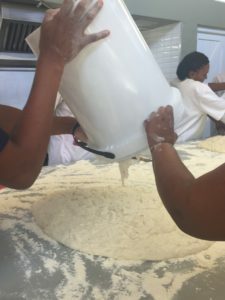 By the second to third resting period, the lid of the bucket will sometimes pop open from all the fermenting gasses and the volume of the dough will increase significantly. After the fourth folding, cut and divide into desired size and weight and allow to rest on well floured bread mats. 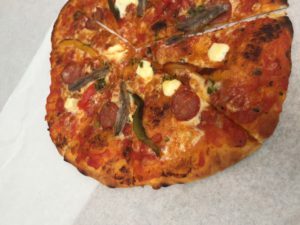 While the Ciabattas are going through their final resting stage, scrape out all the remaining coals from your oven and clean the surface with a wet towel. Allow your oven to get to a comfortable 180 – 200 degrees Celsius. 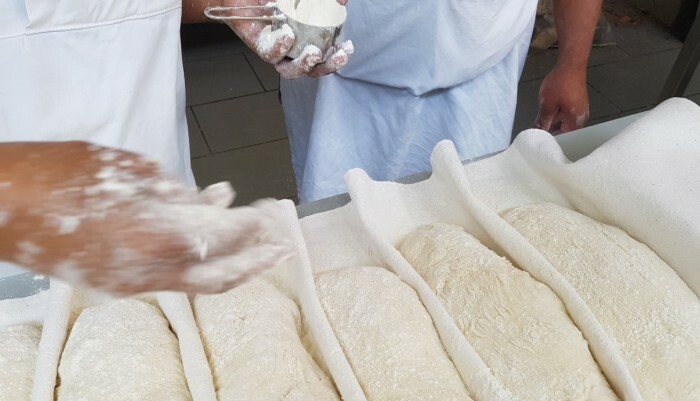 Using a well floured cutting board or plank, flip the dough onto to the board and slide into the oven using a quick movement to make sure the dough stays intact and in it’s form. Place a small steel container filled with water in between the bread in the oven. This will add moisture and steam to give best crust results. Cover the opening to your oven with an oven door and allow to bake for at least 30 minutes. Check your bread along the way. They should have a nice thick and brown crust when they are done and a hollow sound when you tap them them.